On October 20, the Ontario Legislative Assembly will be resuming. Members of Provincial Parliament (MPPs) will be debating Bill 18 — a proposed new law that has the potential to improve working conditions for those in unstable employment. Responding to our past organizing work, the Bill contains provisions to help curb wage theft, protect migrant and temporary agency workers and adjust the minimum wage to keep up with rising prices. For more information see our 4-page backgrounder and 2-page fact sheet on Bill 18. The measures included in Bill 18 are important steps, but we believe they don’t go far enough. When the Legislative Assembly resumes, we will need your help to make Bill 18 stronger and to ensure that our MPPs support it. We are especially looking for people who would be willing to share their personal stories about wage theft, temporary agency work, minimum wages, and unstable and insecure employment. If you are willing to share your story either anonymously or using your own name, please contact us right away at 416-531-0778 x 230 or email us at info@workersactioncentre.org. We expect the legislative process to move quickly after October 20, so stay tuned for more information as it becomes available. WAC members shape public opinion! WAC members have been speaking out and sharing stories to draw attention to the fact that government must take action to improve our wages and working conditions. 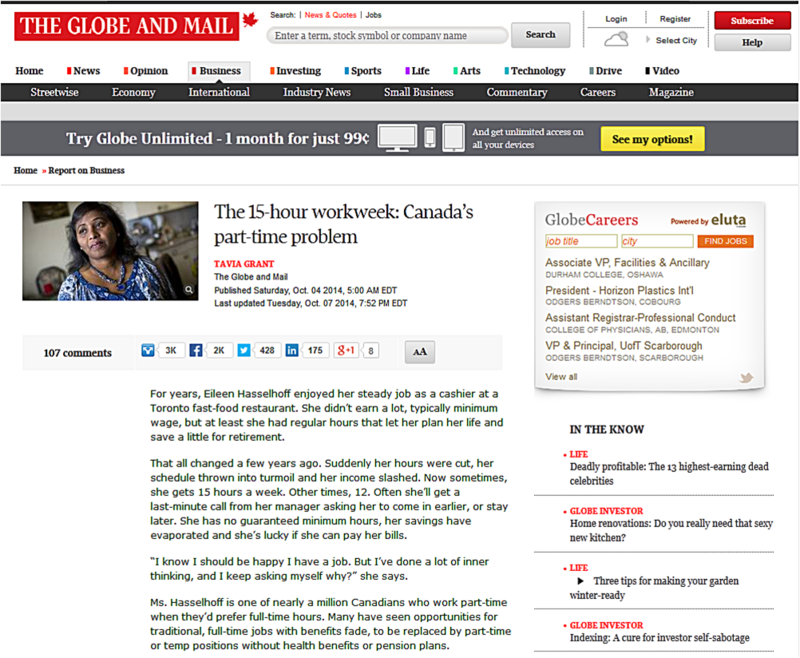 On October 4, the Globe and Mail published an article on part-time, low wage work featuring two WAC members. The article titled” “The 15-hour workweek: Canada’s part-time problem” is available here. 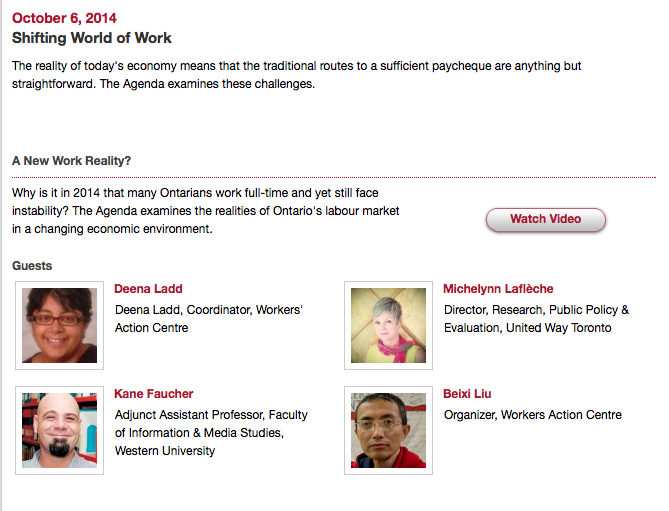 On October 6, WAC was in the news again when Beixi Lui and Deena Ladd participated in a panel discussion featured on TVO’s The Agenda. Watch the video here. 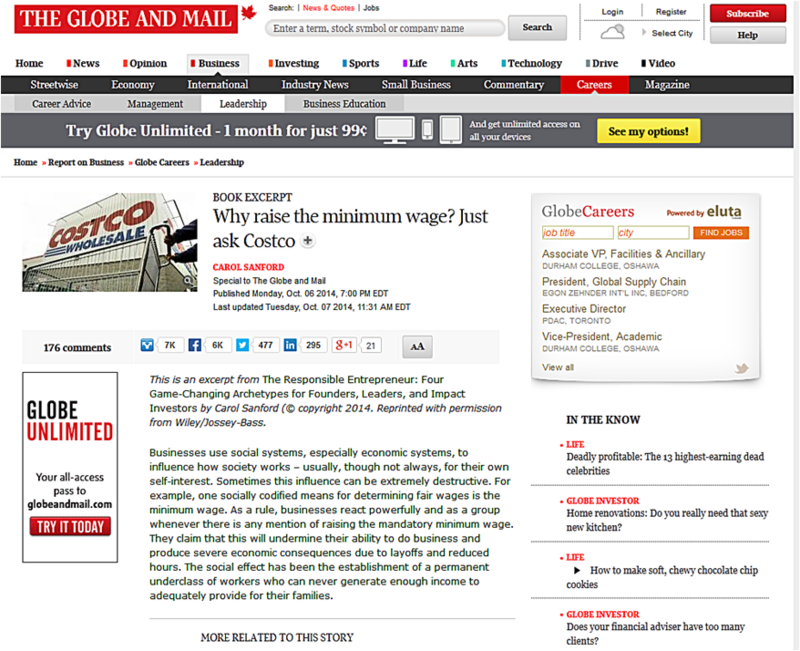 Also on October 6, the Globe and Mail published an excerpt from a book that makes a business case for raising the minimum wage using Costco as a positive example of what responsible business leaders can do to improve wages and working conditions. The excerpt was accompanied by an online opinion poll asking the public whether the minimum wage should be raised and if so, by how much. At its peak on October 8, the online poll showed that over 90% of participants supported raising the minimum wage and fully 76% agreed “a large hike” was needed! 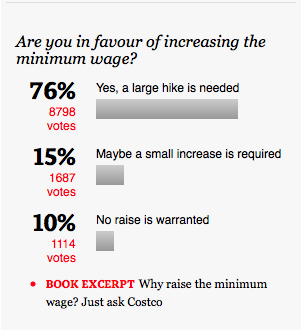 Only 10% opposed increasing the minimum wage. These results are actually an improvement on a CTV poll conducted in the spring of 2013 that showed 80% support for and 20% opposition to raising the minimum wage. Although not scientific, these polls confirm what we have been saying: that support is growing for raising the minimum wage. These polls help remind us that when we speak out, organize and press for change, we can build others’ confidence to do the same. Federally, the Harper government may be moving to take away full access to permanent residency for live-in caregivers, and across Canada caregivers are raising the alarm. 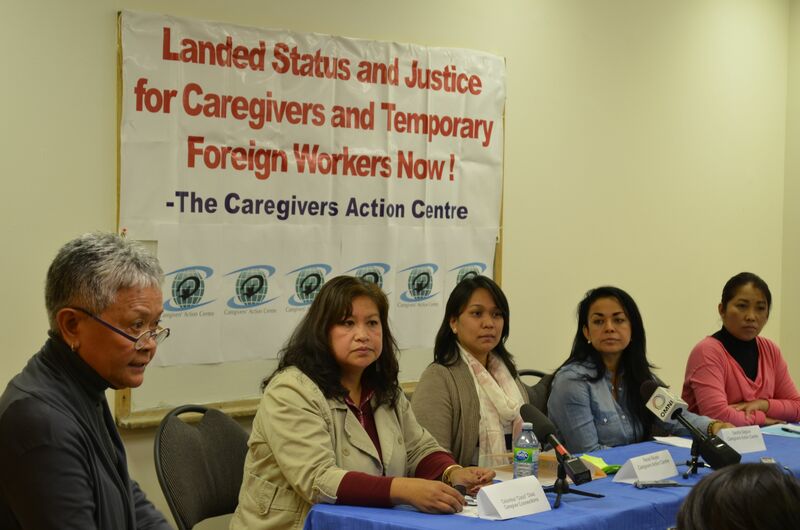 Live-in caregivers are immigrant women who take care of children, the sick and the elderly. On October 9 caregivers organized a news conference held in the WAC meeting room. Caregiving is valuable and necessary work, and like all migrant work, must be dignified with permanent status. Check out national media coverage of their press conference last week, and add your voice to theirs by signing this petition. Let’s keep up the momentum for decent wages and decent work. For more information about our campaigns visit www.workersactioncentre.org. And remember, if you want to share your story, please contact us at 416-531-0778 x 230 or email us at info@workersactioncentre.org.